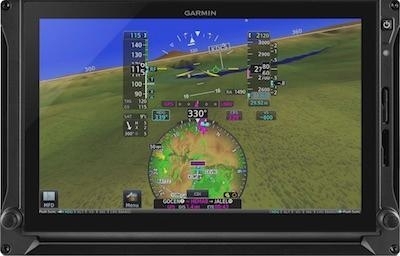 Garmin has announced the touchscreen G500 TXi, G600 TXi and G700 TXi flight displays, as well as the engine information system (EIS) TXi. Boasting a clean-sheet touchscreen design and vibrant presentation, the TXi family incorporates greater situational awareness tools and an innovative feature set into a contemporary avionics platform. Three displays are available, offering optimal flexibility for panel configurations, including a large 10.6-inch display, and two versions of 7-inch displays, in portrait and landscape orientations. The 10.6-inch display can operate as a primary flight display (PFD), multi-function display (MFD) and optional integrated EIS in a highly customized package, while the 7-inch portrait display can be dedicated to any one of those functions. The 7-inch landscape display is available exclusively as a dedicated EIS solution. The G500 TXi system is intended for Part 23 Class I/II aircraft under 6,000 lbs. and the G600 TXi flight displays are intended for Class III aircraft that weigh up to 12,500 lbs. The G700 TXi is exclusively for Part 23 Class IV and Part 25 aircraft that weigh greater than 12,500 lbs. Supplemental Type Certificate (STC) for the G500 TXi/G600 TXi and EIS TXi systems are targeted for approval in Q4 2017, which will feature a comprehensive approved model list (AML) containing over 600 single-engine piston, twin-engine piston and turboprop aircraft makes and models, offering the most configurable, state-of-the-art glass flight display solution in the market. The TXi family incorporates a familiar touchscreen design with modern processors that support improved map and chart rendering, faster panning and contemporary single-finger zoom and pinch-to-zoom gestures. Through any combination of the touchscreen or dual concentric knobs, pilots can quickly access and view flight information at a glance. Modernized displays and large fonts offer improved readability, while the simplistic user-interface helps reduce overall pilot workload. Pilots will also appreciate a familiar in-flight experience behind the TXi series as the user interface is harmonious with multiple Garmin products, such as the GTN 650/750 touchscreen navigators. 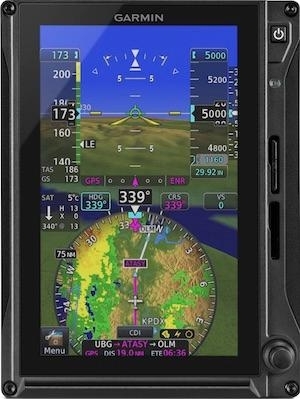 When the EIS TXi system is paired with a GTN 650/750 and Flight Stream 510, Connext automatically downloads engine and other flight information to the Garmin Pilot app on an Apple mobile device, which is then synced to flyGarmin.com. 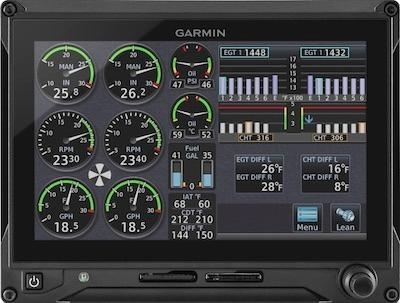 The flyGarmin website allows pilots to view information such as track logs, cylinder head temperatures (CHT), exhaust gas temperatures (EGT), oil temperatures and more. Pilots can also view flight parameters such as altitude and airspeed alongside an interactive moving map on the website. In addition to wireless engine and flight data downloads to Garmin Pilot, data can also be logged and stored on an SD card within EIS TXi. The TXi family boasts a geographical map overlay within the horizontal situation indicator (HSI) on the PFD, which also supports the overlay of NEXRAD, Flight Information Service-Broadcast (FIS-B) weather, SafeTaxi airport diagrams, traffic, terrain and more. For example, pilots can overlay terrain within the HSI map, while simultaneously viewing traffic and flight plan information without significantly diverting their attention away from the PFD. It is also easy to navigate within the HSI map as pilots can simply zoom in/out on the map using a single finger gesture.